The highlight of Puerto Pollensa is the Bay of Pollensa, with the beautiful clear sea and bays and mountains around. 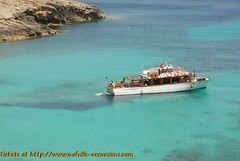 A boat trip is a must do when you are on holidays in Puerto Pollensa, to get to see and enjoy the area from sea. The big Bay of Puerto Pollensa has numerous of lovely bays which you don´t see from the town, it is definitely worth going on a boat trip to explore, enjoy and admire the bay of Pollensa! There are different boat trips possible. All of them will go to one of the most beautiful beaches of Mallorca, Formentor. Formentor, there where is the sand whiter and the sea bluer and brighter. Lovely to spend a few hours, on the beach and in the sea or go for a walk through the stunning landscape. The Robinson Boat takes you out for a whole day of fun in the sun and on the sea. Swimming, snorkeling, fishing, Lunch, Drinks and Music; The Robinson Boat just has it all for a perfect day out! The Robinson Catamaran is a great sailing trip, perfect for the people who love unbathing. Also on this trip Lunch, Drinks and Music is included and they have snorkeling equipment on board as well. Both boat trips will have several stops along the beautiful Bay of Pollensa, and the main stop of the trip is Formentor. That is where we have lunch. You just fancy going to Formentor for a wonderful day on the beach? Than the Ferry boat trip is perfect for you! The ferry is going to directly to this beauty of a beach and it takes 25 minutes to get from Puerto Pollensa to Formentor. On Tuesdays and Fridays the interesting Glass Button Boat is ready to show you the underwaterworld of the Bay and brings you to the lighthouse of Formentor before dropping you of on the Beach of Formentor. 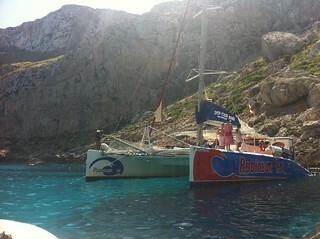 There are a few boats going back from Formentor to Puerto Pollensa, you can take any boat you like to take. For more information, timetables and prices of the boat trips please visit the No Frills Office in Puerto Pollensa!